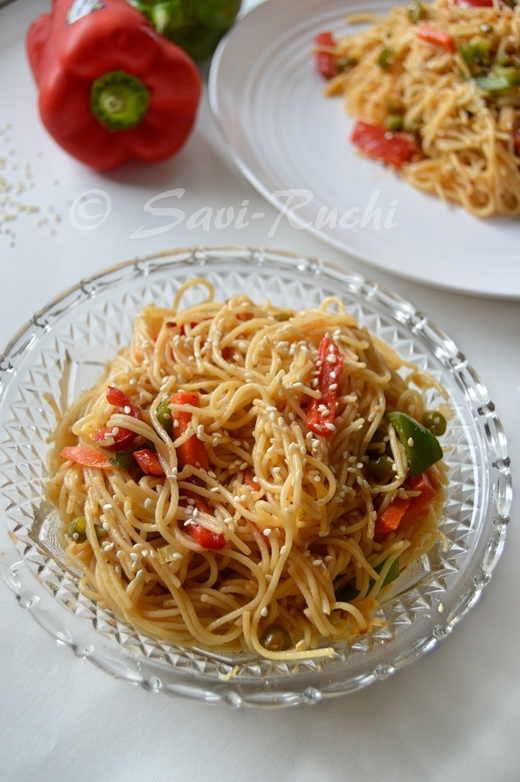 I had bookmarked this recipe from Madhuri's blog around 6 months back. Needless to say, I always postponed doing it for one or the other trivial reasons! Flax seeds are an excellent source for omega 3 fatty acids. They protect our bones, prevent & control high blood pressure, and lower cholesterol level. Many people don't know about this hidden gem. One tablespoon of flax seeds would provide almost 75% of daily requirements of omega 3 fatty acid! 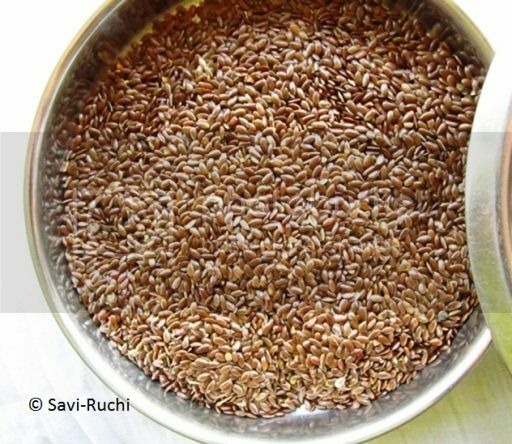 WHFoods has some additional info on Flax seeds. I have used the original recipe as a base & modified according to what I had handy! Here goes my version. Madhuri's version can be found here. Dry roast the channa dal, urad dal & fenugreek seeds together until golden brown. Aroma fills the kitchen when the dals are almost done. Spread it on a large plate to cool. To the same pan, add flax seeds & roast until the flax seeds just start spluttering. Remove from the heat & keep aside in another bowl to cool. 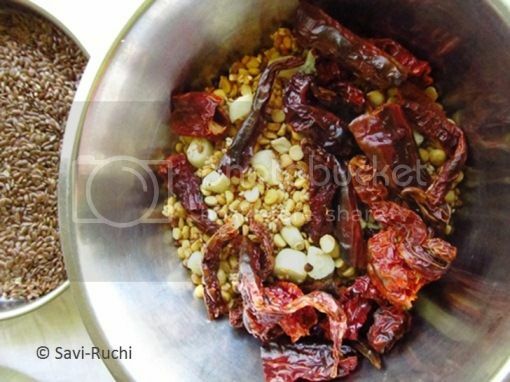 Follow by dry roasting the garlic, sesame seeds, curry leaves & tamarind seperately. Each of them should not take more than a minute! Add it to the cooling channa & urad dal mixture. Finally dry roast the red chillies until you get a strong aroma. Remove it from heat & add it to the channa & urad dal mixture. Add the dry coconut to the hot pan & remove it after 5-10 secs. Keep it aside for cooling. 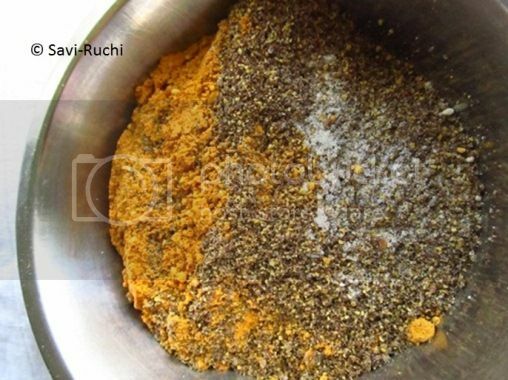 Allow the flax seeds & the dal mixture to cool completely. First add the channa, urad dal mixture along with chillies, sesame seeds, garlic, curry leaves & tamarind to the mixie/blender & make a coarse powder of it. Towards the end of making the powder, add jaggery, salt & asafoetida. Pulse again for couple of seconds. Scoop it out in a bowl. Follow it my making a coarse powder of flax seeds. Add the flax seed powder to the dal mixture. Mix both the powders thoroughly & allow it to cool completely. Store it in air tight containers & use as required. 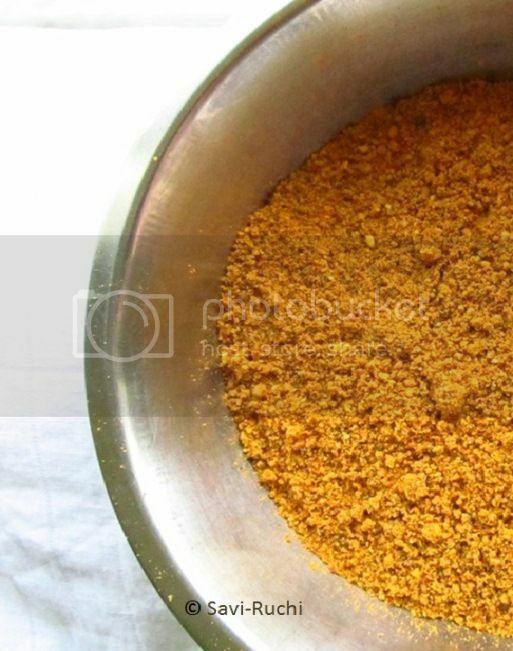 Chutney powder/pudi is a must at our home for plain dosa & akki rotti. My son loves to eat it with chapathi/Indian bread & idli too. 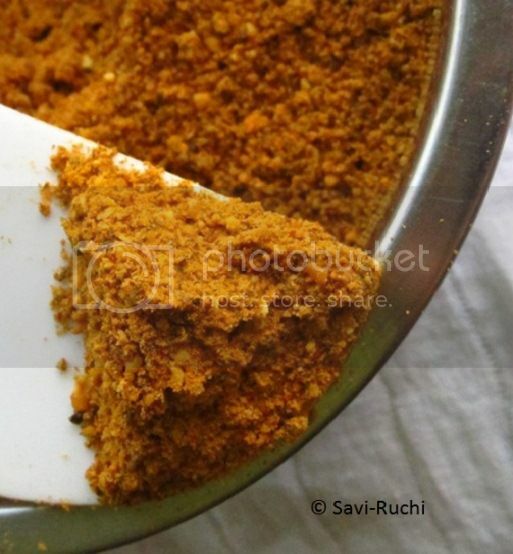 Unlike menthyada hittu, this chutney pudi/podi is coarsely powdered. 1 medium sized broccoli or 2 cups grated broccoli. Mix all the ingredients mentioned for the dough (except water). Slowly add few tablespoons of water at a time & prepare a soft dough. The dough should not be sticky. Knead for 5 mins until the dough becomes pliable. Rest the dough covered for a minimum of 30 mins. Heat oil in a broad pan. When oil is hot, add the grated green chilli & broccoli. Sprinkle salt. Mix well & saute on a high heat for 2 mins. Reduce the heat to medium & cook for another minute. Turn off the heat. Add lemon juice & mix well. Keep it aside. Knead the dough again & divide the dough into lemon sized balls. Roll the ball using a rolling pin to 3/4th the size of the palm. Place 1 tbsp or a little more of the stuffing in the center of the rolled ball. Cover the stuffing (refer pictures below). Pinch out the extra dough if any (refer pictures below). Generously dust the stuffed ball. Roll the stuffed ball carefully into a 5 to 6 inch diameter circle using a rolling pin. Flip the paratha & cook on the other side too. Remove the cooked paratha from the heat. Add a blob of butter & serve immediately! Repeat the procedure with the remaining dough balls. 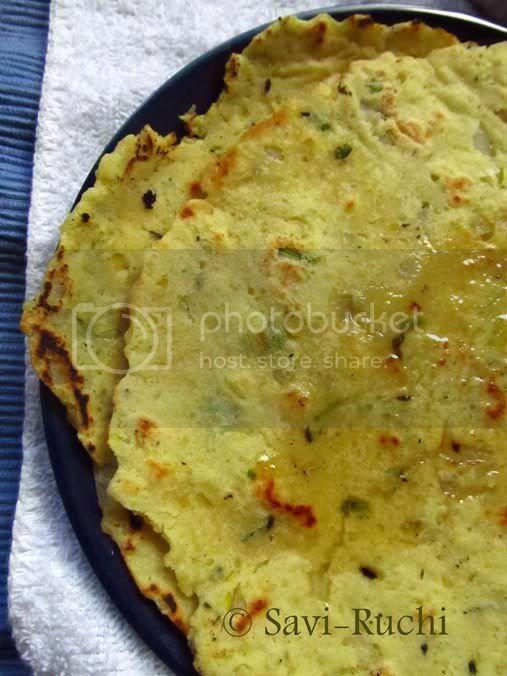 I served the paratha with green gram dal. It is very important to keep the stuffing dry, else the stuffing will start oozing out when you start rolling the stuffed balls. 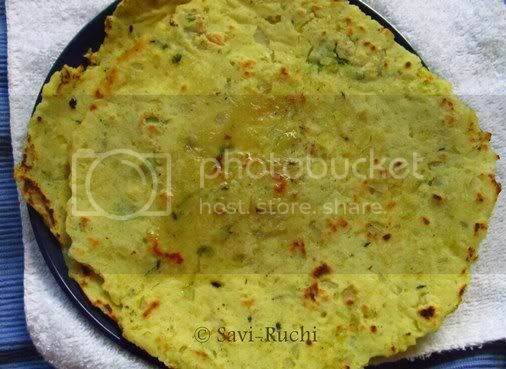 If you are beginner at making parathas, try with a little stuffing at a time. May be a tsp to begin with. Increase the stuffing as your confidence in preparing them increases. The safest stuffing to start with for making parathas are green peas stuffing, broccoli stuffing and paneer stuffing, because they don't ooze out water like potato stuffing or raddish stuffing. 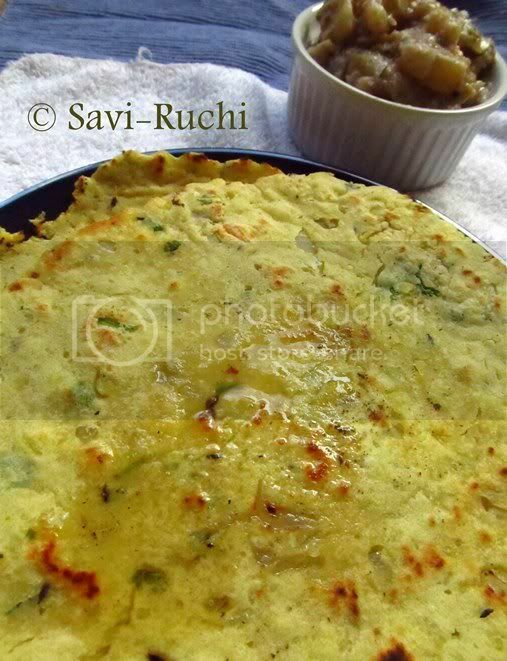 Rotti/Thalipeeth made with left over khichdi or pongal! 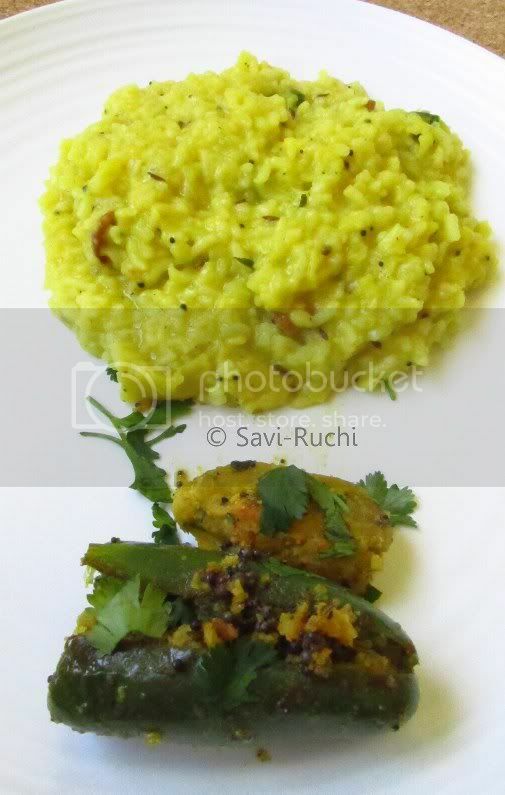 Khichdi is a comfort food for most of us. Myself being a South Indian got used to it 4-5 years back & yet has become our family's comfort food. My son loves eating them & hence it is in our menu list at least once a week. However, no one wants to finish off the left over khichdi after it turns cold. Though I manage to reheat it, it was always sidelined. As such for this recipe, there is no hard & fast rules for measurement. Throw in how much ever you want & you will be happy with the results. The measurement given below is just a reference. Mash the khichdi/pongal thoroughly ensuring there are no lumps. You could even pulse it in a food processor for a couple of seconds. Add the ingredients mentioned (for the dough) to the mashed khichdi (except water). Mix thoroughly. Add 2-3 tbsp of water at a time & make a soft yet firm dough. Divide the dough into big lemon sized balls. Place the ball on a greased brown paper(refer notes*). Pat the ball using your fingers. It is better to dip the fingers in cold water in between patting to remove the stickiness from the dough. Ensure the thickness is even. Refer here for pictorial illustration. Heat the tawa/griddle. Grease the tawa. Put the rotti upside down on the tawa. The patted rotti should be placed on the tawa. Cook the rotti along with the paper for a minute on medium heat. Gently remove the paper. Add a tsp of oil & cover the rotti with a lid & cook it again for a minute. Flip & cook on the other side for a minute, either covered or as is. Serve it hot with a side dish of your choice. I served mine with potato stew. *If you cannot catch hold of brown paper, you could use aluminium foil/plaintain leaf/cigarette paper/wax paper . My son is having holidays at school which means more cooking to me! 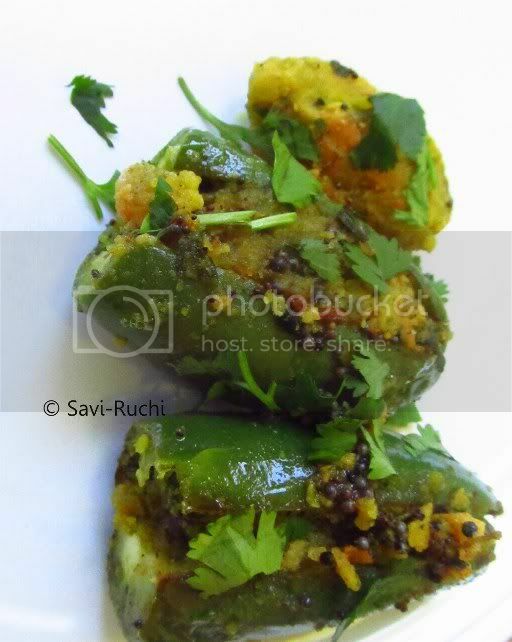 Few days back, he demanded a khichdi/pongal & I made these stuffed jalapenos to go with it. It tasted heaven! It does not take much effort & your taste buds will jump with joy. 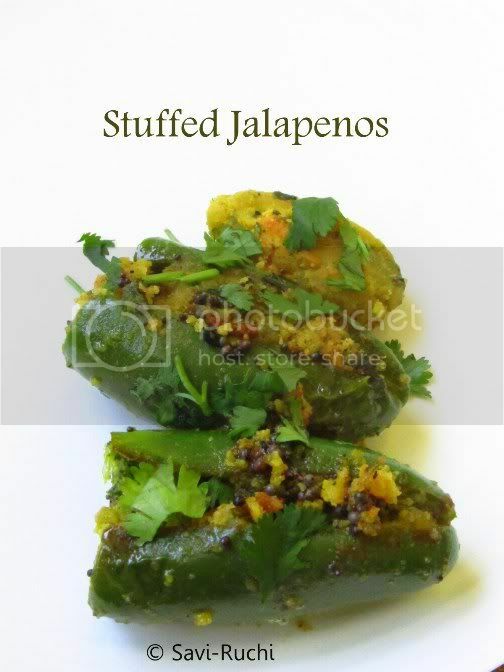 PS: I made only 3 stuffed jalapenos for myself & hence using the measurements given below. If you want to make it for 3-4 people, use the measurements given here. Wash & pat dry the jalapenos. Slit & de-seed. Stuff the jalapenos with this mixture. Heat oil in a pan. When oil is hot, proceed with mustard seeds & asafoetida. Add thestuffed jalapenos & cook the jalapenos on a low heat for 8-10 mins. Keep it covered while cooking. Don't forget to toss it once in every 2-3 mins.